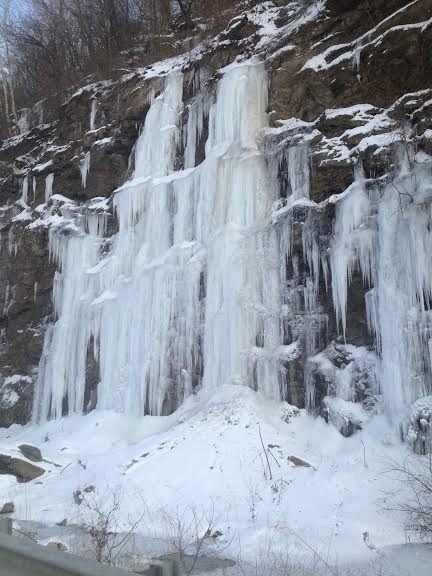 I was traveling north on the 906 when "what to my wondering eyes should appear" but a magnificent waterfall, frozen in time. I readily admit that I find time travel and parallel universes perplexing, but even more confusing was discovering that somehow on my way to the Mon Valley Fitness Center, I ended up on the ice planet, Hoth. I beg to differ with Han Solo who told me, "There isn't enough life on this ice cube to fill a space cruiser." In fact, there is plenty of life in the Hoth Valley. For example, Frank Sinatra sang to a sold out crowd at the Willow room on Valentine's Day. Either that or his doppelganger, Nick Fiasco, did the vocals. (Doppelganger is a very funny word.) If a person can be in 2 places at once (bilocation), does it follow that a location can be in 2 locations at once? I'm just saying ... Hoth and the Mon Valley seem identical to me. I'm proposing our bilocated Valley begin an all out tourist blitz. We can advertise tauntaun rides, ice boarding and hover skiing as just a few of our attractions. We can build an ice hotel like the Icehotel in Jukkasjarvi, Sweden. (Jukkasjarvi would be a funny word if I could pronounce it. Ja?) We can rebuild it every year from December to April. We'll construct the chairs, beds, etc. from snow and ice blocks taken from the nearby Monongahela River. As long as the structure remains below freezing, around 23 degrees F, we're frozen golden. Let's not miss the snowspeeder by dragging our boots on this! Of course, we can't mention the shaggy and carnivorous Willy Wampas that try to eat our guests. Or the occasional pirate and smuggler. That's where our snowtroopers (not to be confused with the Dark Side Imperial snowtroopers) led by Monessen's Chief Snowtrooper, John Mandarino, come in. Their duty is to protect and serve this frigid biosphere. So as you are observing the speed limit on the 906 and admiring the White Cliffs of Hoth/Monessen, be thinking of additional activities for our soon to be arriving tourists. We already have advance reservations from The Rat Pack: Dean Martin, Sammy Davis Jr., Peter Lawford, Joey Bishop and of course, Ol' Blue Eyes himself. Please email your ideas to newly knighted Jedi and rebel, Kanela, at sandraseeley.com. We want to put this road less traveled on the world map. My assistant, Wolfgang, has volunteered to be our first tour guide. He wants everyone to know his favorite movie is Scent of a Wampa! And if he scents one, he's outta there! I am surprised, and just a little frightened, of your knowledge of Star Wars trivia!